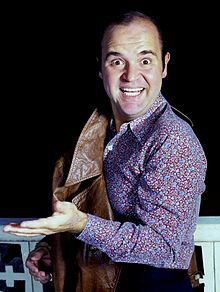 Dominick DeLuise (August 1, 1933 – May 4, 2009) was an American actor, voice actor, comedian, director, producer, chef and author. He was the husband of actress Carol Arthur and the father of actor, director, pianist, and writer Peter DeLuise, and actors David DeLuise and Michael DeLuise. He starred in a number of movies directed by Mel Brooks, in a series of films with career-long best friend Burt Reynolds, and as a voice actor in various animated films by Don Bluth. DeLuise was born in Brooklyn, New York, to Italian American parents Vincenza "Jennie" (née DeStefano), a homemaker, and John DeLuise, a public employee (garbage collector). He was the youngest of three children, having an older brother, Nicholas "Nick" DeLuise, and an older sister, Antoinette DeLuise-Daurio. DeLuise graduated from Manhattan's High School of Performing Arts and later attended Tufts University in Medford, Massachusetts. DeLuise was Roman Catholic and had a particular devotion to the Virgin Mary. In 1961, DeLuise played in the Off-Broadway musical revue "Another Evening with Harry Stoons"  that lasted nine previews and one performance. Another member of the cast was 19-year-old Barbra Streisand. He was also in the Off-Broadway play "All in Love" which opened on November 10, 1961, at the Martinique Theatre and ran for 141 performances. Other New York theater performances include, "Half-Past Wednesday" [Off-Broadway] (1962), "Around the World in 80 Days" [Off-Broadway] (1963), "The Student Gypsy" [Broadway] (1963), "Here's Love" [Broadway] (1963), and "Last of the Red Hot Lovers" [Broadway] (1969). DeLuise generally appeared in comedic parts, although an early appearance in the movie Fail-Safe as a nervous USAF technical sergeant showed a broader range. His first acting credit was as a regular performer in the television show The Entertainers in 1964. He gained early notice for his supporting turn in the Doris Day film The Glass Bottom Boat (1966). In his review in The New York Times, Vincent Canby panned the film but singled out the actor, stating, "[T]he best of the lot, however, is a newcomer, Dom DeLuise, as a portly, bird-brained spy." DeLuise also lent his distinct voice to various animated films and was a particular staple of Don Bluth's features, playing major roles in The Secret of NIMH, An American Tail, A Troll in Central Park and All Dogs Go to Heaven. All Dogs Go to Heaven also featured Reynolds' voice as Charlie B. Barkin, the cheeky anti-hero, and DeLuise voiced Itchy Itchiford, Charlie's best friend, wing-man and later partner in business. Unlike DeLuise, however, Reynolds did not voice Charlie in any of the eventual film sequels, TV episodes, TV-episode sequels, or TV series. DeLuise also voiced the legendary character of Charles Dickens' Fagin in the Walt Disney film Oliver & Company and made voice guest appearances on several animated TV series. TV producer Greg Garrison hired DeLuise to appear as a specialty act on The Dean Martin Show. DeLuise ran through his "Dominick the Great" routine, a riotous example of a magic act gone wrong, with host Martin as a bemused volunteer from the audience. Dom's catch phrase, with an Italian accent, was "No Applause Please, Save-a to the End." The show went so well that DeLuise was soon a regular on Martin's program, participating in both songs and sketches. Garrison also featured DeLuise in his own hour-long comedy specials for ABC. (Martin was often just off-camera when these were taped, and his distinctive laugh can be heard loud and clear.) In 1968 he hosted his own hour-long comedy variety series for CBS, The Dom DeLuise Show. Taped in Miami at The Jackie Gleason Theater it featured many regular Gleason show cast members including The June Taylor Dancers and The Sammy Spear Orchestra. Dom's wife Carol Arthur also regularly appeared. The 16-week run was the summer replacement for The Jonathan Winters Show. He later starred in his own sitcom, Lotsa Luck, which only lasted for 1973-1974 season. DeLuise was probably best known as a regular in Mel Brooks' films. He appeared in The Twelve Chairs, Blazing Saddles, Silent Movie, History of the World, Part I, Spaceballs, and Robin Hood: Men in Tights. Brooks' late wife, actress Anne Bancroft, directed Dom in Fatso (1980). He also had a cameo in Johnny Dangerously as the Pope and in Jim Henson's The Muppet Movie as a wayward Hollywood talent agent who comes across Kermit the Frog singing "The Rainbow Connection" in the film's opening scene. He also guest-starred in Season 2 Episode 11 of The Muppet Show, where he interacted with Miss Piggy and appeared with fellow Brooks regulars Gene Wilder (who directed the film as well), Marty Feldman, and Madeline Kahn in The Adventure of Sherlock Holmes' Smarter Brother, as well as alongside Wilder and Gilda Radner in a later Gene Wilder-directed film, Haunted Honeymoon. He also appeared in Stargate SG-1 as Urgo. An avid cook and author of several books on cooking, he appeared as a regular contributor to a syndicated home improvement radio show, On The House with The Carey Brothers, giving listeners tips on culinary topics. He was also a friend and self-proclaimed "look-alike" of famous Cajun chef Paul Prudhomme and author of seven children's books. In 1964, while working in a Provincetown, Massachusetts, summer theater, DeLuise met actress Carol Arthur. They married in 1965 and had three sons, all of whom are actors: Peter, Michael, and David DeLuise. DeLuise died of kidney failure on May 4, 2009, at Saint John's Health Center in Santa Monica, California. He had been battling cancer for more than a year prior to his death. ^ a b "Dom Deluise Biography (1933- )". filmreference.com. Retrieved May 18, 2011. ^ Nathan Southern. "Dom DeLuise Biography". The New York Times. Retrieved May 18, 2011. ^ "Barbra Archives". Retrieved February 17, 2013. ^ Streisand, Barbra. "Value". Live at the Bon Soir (1962). Retrieved February 17, 2013. ^ "All in Love Original Off-Broadway Cast - 1961 Off-Broadway". www.broadwayworld.com. Retrieved November 25, 2016. ^ "Dom DeLuise Theatre Credits". www.broadwayworld.com. Retrieved November 25, 2016. ^ Vincent Canby (June 10, 1966). "Movie Review: The Glass Bottom Boat (1966)". The New York Times. Retrieved May 18, 2011. ^ Heather Buckley (March 9, 2010). "Horror at the Oscars Part 2: This Time it's Personal". Dreadcentral.com. Retrieved May 18, 2011. ^ "Obituaries: Actors Dom DeLuise and Beatrice Arthur; mezzo Margreta Elkins; soprano Anne Brown, Gershwin's original Bess; composer Lukas Foss dies at eighty-six". Opera News. 74 (1). July 2009. Retrieved June 20, 2009. ^ "In The Kitchen with Dom DeLuise". OnTheHouse.com. Retrieved May 18, 2011. ^ McLellan, Dennis (May 6, 2009). "Dom DeLuise dies at 75; actor was a 'naturally funny man'". Los Angeles Times. Los Angeles, California: Tronc. Retrieved May 18, 2011. ^ a b c Grimes, William (May 5, 2009). "Dom DeLuise, Comic Actor, Dies at 75". The New York Times. New York City: New York Times Company. Retrieved June 27, 2017. ^ "Dom DeLuise dies at 75". CNN. June 6, 2011. Retrieved May 5, 2009. McLellan, Dennis. "Dom DeLuise dies at 75; actor was a 'naturally funny man'", Los Angeles Times, May 6, 2009.